The Pew report found that while income inequality increased in all groups between 1970 and 2016, it increased the most among Asian Americans. Asian Americans and Pacific Islanders now have the highest income inequality of any racial or ethnic group in the U.S.; Asian-American and Pacific Islander adults in the 90th income percentile earn more than 10 times of those at the 10th percentile, a new analysis of government data has found. The report, released Thursday by the Pew Research Center, found that while income inequality increased in all groups between 1970 and 2016, it increased the most among Asian Americans and Pacific Islanders in part due to the immigration-driven growth of that community. 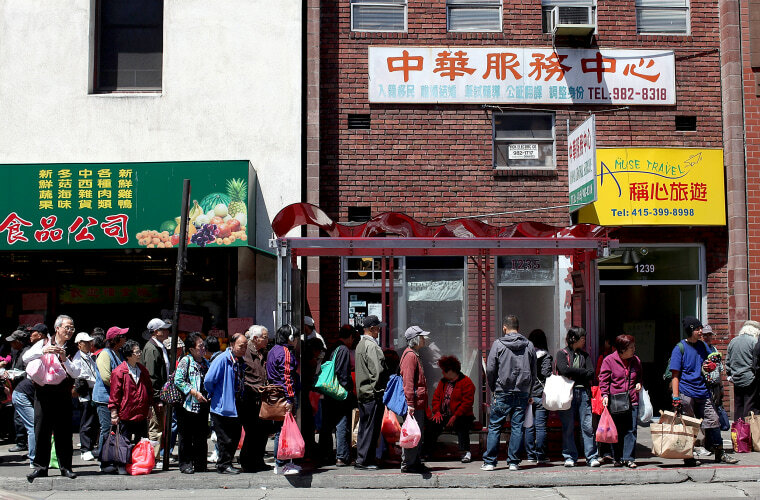 Asian Americans were the fastest growing racial group in the U.S. from 2000 to 2015, growing 72 percent from a population of 11.9 million in 2000 to 20.4 million in 2015, according to Pew. New immigrant arrivals from Asia also outnumbered those from other regions of the world in recent years, with 37.4 percent of arrivals coming from Asia in 2015. The analysis released Thursday found that while Asian Americans and Pacific Islanders had the lowest income inequality among analyzed groups in 1970 — with the 90th percentile making $68,192 in 2016 dollars, 6.1 times more than the 10th percentile at $11,270 — by 2016, they had the highest, with the 90th percentile making $133,529, 10.7 times more than the 10th percentile at $12,478. In contrast, non-Hispanic whites at the 90th percentile made $117,986 in 2016, 7.8 times more than the 10th percentile at $15,094. To be sure, Asian Americans and Pacific Islanders in aggregate and on average made more money than other groups, though the report noted that education and income varied widely among sub-groups. For instance, while 72 percent of Indian Americans 25 and older had at least a bachelor’s degree, only 9 percent of Bhutanese Americans did. In 2016, the median income for Asian-American and Pacific Islanders adults adjusted for family size was $51,288, according to the report, compared to $47,958 for whites, $31,082 for blacks and $30,400 for Hispanics. Income for Asian Americans and Pacific Islanders at the 90th percentile was also higher than whites, blacks, and Hispanics, though those at the 10th percentile lived on $12,478, 17 percent less than whites. Blacks and Hispanics at that level trailed by even more, making $8,201 and $9,900, respectively. The Pew report calls to attention the realities of Asian-American and Pacific Islander (AAPI) communities, Seema Agnani, the executive director of the nonprofit National Coalition for Asian Pacific American Community Development (National CAPACD), which works to improve the quality of life for low-income Asian Americans and Pacific Islanders, said in an emailed statement. The organization had noted "dramatic increases in the numbers" of those living in poverty despite rising median household incomes, Agnani, who was not involved in the report, said.